The past year has been a bit of a whirlwind for me. My teaching philosophy has been tested, pushed and expanded -all in a positive way. I have created this short video clip to share how I went from not believing and understanding how technology does have a place in the primary classroom to now recognizing how technology supports many of the aims and goals I have as an educator. I want to emphasize that technology has changed our way of learning in a positive way; however, technology is not the be all end all of my program. My program is based on inviting learners to share their wonders, their ideas and most of celebrate how each child is a bearer of knowledge and capable of learning and succeeding. Yes, our learning has grown and become more visible thanks to technology, but I truly believe that it is the way we are interacting with technology, as a tool, that deepens our learning and furthers our learning process. I recognize that technology is NOT something new, but it was something new to me. I recognize that each school has different tools and different focuses. I recognize that each teacher is entitled to lead a program that best fits their learners and is pedagogically sound with the curriculum. I recognize that each class cohort composition is different. I want to reemphasize that technology is NOT something new, but it has become a part of my teaching journey and fits well with my inquiry-based philosophy. The learning in my classroom has changed and many doors have opened for both myself and my learners. Our inquiry projects have become more meaningful through creating documentation projects to share our learning and make our thinking visible to others, it has invited and allowed us to connect with other audiences than just our classroom wall, our connection with the families in our room has become daily and meaningful and this tool is another way we are empowering learners to follow their interests. My professional learning network has significantly grown and has supported me to the greatest extent. The professional development opportunities that have arose from being open and trying something new have been irreplaceable, I am extremely grateful. Stepping out of my comfort zone has been a fabulous learning experience. Overall, I would like to remind my audience that I believe that technology is just another tool, and as educators we juggle many tools and strategies in our philosophy and programs. For me, just simply having technology in my room does not fully meet my needs nor does it meet the needs of my learners. For me, technology must be integrated into our learning in purposeful ways that further our learning, make our learning visible, connect us with various audiences and help to highlight our passions through research and ongoing learning projects. Please share this post with your colleagues & friends! This all started out, one Friday morning two avid Pic Collagers asked if they could make a slideshow teaching their friends how to make a Pic Collage. Together, they created an Adobe Voice which would lead their audience through the steps to make a Pic Collage. Pic Collage creating, using the iPad minis, is always an option during our free exploration play time. Children use the iPads to document learning that is taking place around the room. They then create a Pic Collage with their photographs, added details and text. They often share their collages with our class or on their e-portfolios, using Fresh Grade, with their families. The next week they asked me when they got to share their video, which I explained was a tutorial, to their friends and teach them how to make a Pic Collage. I quickly realized that they were not only wanting to share their video but guide their friends in creating their own Pic Collages. I responded with the question: “Are you wanting to lead a lesson then?” Right away I was met with wide eyes and big smiles responding YES we do! I explained that a lesson would be a chunk of time where they were in the teacher role of guiding their peers in a few different activities. We briefly chatted about what this might look like and by this point, they were jumping up and down with excitement. They proceeded to use the next forty minutes of their play exploration time to plan and act out their lesson using the screen and our document camera. When 1:30pm rolled around, they had asked about 10 times when they got to teach their lesson, each time I smiled and pointed to our daily schedule, but I was overjoyed with how excited and passionate they were to lead their peers in learning something new. Reflecting on this now I am floored by their confidence, passion and ability to engage their peers at the age of five years old! These two young learners are incredible leaders. The lesson went off with great success, their peers were hooked within the first minute and seemed empowered by their two friends leading their learning. The girls had practiced their lesson by opening with showing their video tutorial, then leading their peers through a 5 minute demo of using the app under the document camera. One of them stood at the screen with our magic wand pointing and explaining in a mix of French and English, whilst the other led on the iPad; it was a great example of team teaching! Next, they invited a peer up (who is also an avid Pic Collager) to show one example of her work (inspiration much?!). She proudly shared her work and seemed excited to have been asked to be a part of this. They then had previously organized our name tag magnets into small groups, they explained that each group had to create their own Pic Collage with colours and their names as text (come on, they even unknowingly had come up with criteria for this activity -so neat). The girls walked around during the activity and supported their friends, answered questions and helped them through the different steps. What a success! Their peers were excited and responded well to their video, lesson and activity. This thirty minute session was a powerful demonstration of how learners can facilitate learning in the same way as educators can. I loved observing their team teaching and patience with one and other. I felt inspired just sitting back and watching them teach. Together we came up with plan to take their lesson to our Kindergarten friends across the hall and they cannot wait until after our break to do so! How do you provide learners with opportunities to lead learning and guide their peers? Please share this post with your friends & colleagues! Draw and Tell! Draw and Tell! Draw and Tell! Join me in a big cheer for this app. Over the past month, we have been busy exploring and finding ways to use Draw and Tell to make our learning visible, practicing our math strategies and skills and recording our voice to explain our thinking for our assessment component. I was introduced to this app at an iOS Summit, in Vancouver, by Karen Lirenman and am SO thankful. In my opinion, this app is somewhat similar to Explain Everything because of the ability to create a background or image and then record your voice and explain your thinking. There are many differences but in both apps you have the option to record voice over a created image. 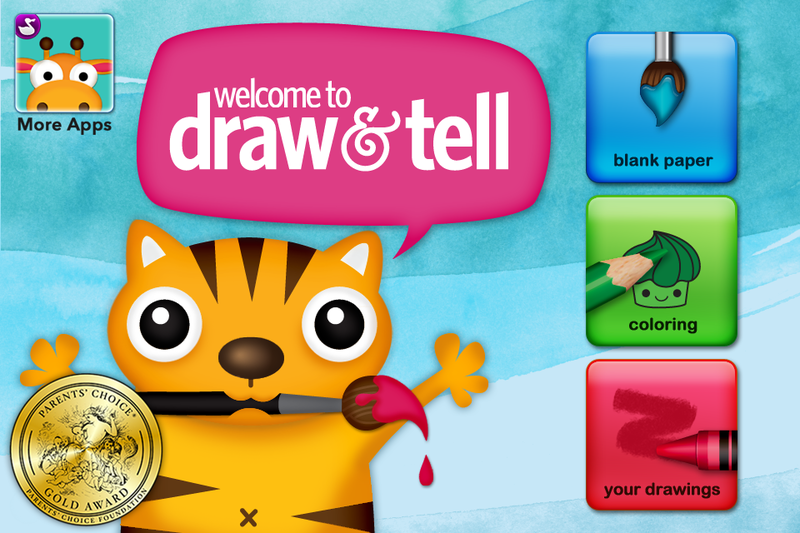 Draw and Tell is not as complex nor as interactive as Explain Everything, but I believe that is why it works so well for primary student learners. Draw and Tell allows you to create a scene or background and then record voice to lay over your image whilst moving the stickers and using a pointer to underline or circle areas of your image. Unlike Explain Everything, Draw and Tell only allows you to create one slide/image and only import a photograph as the full background, the record option only allows you to underline or circle with a pointer and move stickers (not shapes, images or text like Explain Everything does). I have found that on our iPad air the pointer shows up as a blue circle, but on our iPad minis the pointer shows up as a sticker (not as great as the blue pointer, I think this might be a glitch). Once you are finished recording, you can save the clip as a video onto your iPad and then share, export or import it into another app. To introduce Draw and Tell we started with making a digital alphabet class book as a whole group. We created pages for each letter, added our classmates’ names who begin with the letter, and scrolled through the stickers to find objects that started with the letter. After, my plan is to import the saved video into Explain Everything to add the classmate’s picture next to their name to add another visual element. My plan is import all the separate letter video files into iMovie or Book Creator in the end to make a finished product that can be shared with families as a practice tool for at home. This whole group process of using Draw and Tell helped to model and scaffold the app before having student learners individually interact with the app, it was a powerful initial introductory step. We then started using Draw and Tell as part of our ‘Ways to Make 5’ learning activities. We had been exploring a lot outdoors to find different materials to make 5 and doing hands-on exploration during our math stations so the concept was fresh and current for us before we started incorporating Draw and Tell into the mix, thank you to Karen for this idea. I introduced it as a whole group math learning activity one day and then the next added into our math station mix. Our student learners immediately were flying with using the stickers, paint brushes and pattern prints to create various representations of the number five. We then shifted our learning focus more towards patterning, and I came across an awesome blog post about using Draw and Tell in French Immersion Kindergarten to demonstrate AB patterning and to assess their understanding in a Draw and Tell clip. Once again we did an initial group lesson, and then added it into our math patterning stations. After a few sessions of using it, I pulled one student learner at a time to do this activity. A big thank you to Mme Kathleen for this activity inspiration, merci! I ended up using this as an assessment piece to add to their Fresh Grade portfolios to demonstrate their ability to create and continue an AB pattern using various objects and to record their explanation in a combo of French and English for families to understand. I am looking forward to using some time over the break to further research and find more ideas of how to use Draw and Tell in a primary classroom to make learning and thinking visible. I value providing hands-on learning exploration with natural materials and manipulatives, then moving to a whole group introduction to how we are focusing on the same skills but using Draw and Tell as a tool to show our learning, then adding voice explanations of their thinking for assessment. I would love to hear how you are using this app in your learning activities and to make thinking visible as an assessment piece. I know I can’t really do a review for an event that I co-hosted and co-planned with my kinder learners, but I can’t help but celebrate this evening! It was our Inquiry Project Expo evening which families and guests attended. I am so grateful for the positive energy from both the kinder learners and their guests this evening. Walking around the room was tough because it was so crowded with celebration, love and joy! I was beaming a huge smile, so proud of all the learning, sharing and the celebration of the LEARNING PROCESS that was going on in our room. Each partnership had their own table set up, similar to a science fair or market style, to showcase their research booklets, brochures, model, an iPad with their video creations and their library non-fiction texts. Families started by visiting their child’s booth and then circulated to the other children’s areas in the classroom. Families were interacting and celebrating with not only their child but every child in the room, they were an authentic audience to showcase our learning to. They asked questions, showed interest in our research books as well as our video projects, they congratulated learners and most of all were impressed by five year olds!! Wow! What an evening. Over the past two months we have been inquiring about a chosen topic with a partner. Choice, leadership, control, decision making, problem solving and creativity have been (and will continue to be!) KEY throughout this project. Back in January, together we started brainstorming topics of interest to our group, we ended up with about 20 projects listed up on the board. We then begun with moving our names to topics that interested us. We ended up with ten different pics with groups of 2 or 3 learners. Rabbits, Dogs, Trains, Volcanoes… the list goes on! We began our inquiry journey by following a research guide booklet to direct our questions, learning and research for the first portion of the project. We had already gone through the same research guide booklet as a whole group focusing on penguins, so we were somewhat familiar with using non-fiction texts to research and record facts in our booklets. I believe that inquiry most begin with interest and wonders, so we had interest next came our wonders. We shared our wonders and what we hope to learn. Next we used our non-fiction texts and iPads to research about the appearance of our topics, different things are topic can do, the parts of our project (head, toes, or wheels, etc) and why our topic is important. Once we he completed the research portion, we began coming up with ways to share our learning. We decided to use Chatter Pix Kids (iPad app) as a tool to share something our topic could do. Bunnies can jump, or trains can go really fast. This app is so much fun and can be used in endless ways!! We continued on and decided we should make models, so we spent a few days up in our Maker Space designing, building and creating models of our topics. It was SO neat to watch the projects be planned and then created all by the children. We then were so excited about our models that we decided to create short video introducing them to others! We shared our videos with our families via Fresh Grade and they were amazed with our technical and design work. We used our Green Screen to help make these videos and the Do Ink iPad app to film and put ourselves in front of a picture of our topic. We were very enthusiastic about creating with the Green Screen so we had a special class viewing celebration in the library. Someone then suggested that we do art pieces and make an art gallery for our bulletin board showcasing our topics. We did oil resist painting and then used the block tempera paints and shiny paper to decorate our work! Partners worked together to add a title and glue them on a joint poster. We also added QR codes, and had parents use the QR Reader iPad app to scan the code that linked to our Green Screen videos! Some groups decided to use Puppet Pals to share more of their learning and to make their research visible to others. They added their own artwork and chose backgrounds. Next they added 3 things that their topic CAN do. We decided to make brochures to share our learning. We had free range of what these brochures looked like but understood that somehow they had to share our learning and would be handed out during our Project Expo. We made one copy and got to use the photocopier to make more copies, this was so exciting! We then coloured and added more details to our copies. Some of us have spent almost every free exploration time, since last Tuesday, colouring our photocopies!! Then came the planning of our Expo! This was such an exciting part, we knew we wanted it to be similar to a market or fair. We wanted to have our own booths, and have families circulate through so we could share about our projects and hand out brochures. We stared by making invitations to send home, posters and lists to decorate the doors… we continued on to having children bringing in posters which had been made at home and groups of children who made a slideshow that would be looped on the screen throughout the evening to music. Wow wow wow! What a great experience where choice, interest and wonders drove our learning and research and empowered us to take our learning further and deeper. What a memorable and magical experience for our learning community.